Love the sign in front of the bear! Glad you posted it anyway. Referring to yourself in the third person is starting to weird me out a bit. 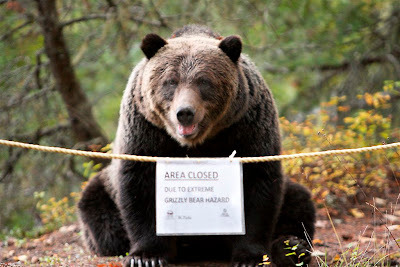 Hey Grizzly - what is the population of grizzlies in Bella Coola? Are they around throughout the year or do they only show up when it is fishing season? Hi Grizzly, my husband and I follow your posts with interest, we saw a BEAUTIFUL home for sale in Chilcotin for only $198,000. Was wondering if this was anywhere near you? We live in Ont and hoping to retire away from it all. We know Bella Coola is isolated but that doesnt bother us. Could this be why this beautiful home is such a reasonable price?